As seen on TV...these are the fast-dry towels that are best for beach, sports, & travel. 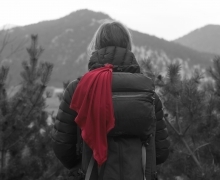 Featured in dozens of major magazine gear reviews such as Backpacker Magazine, Practical Sailor, GearTrends.com, Camping Life, Boating Magazine, and Chicago Tribune Travel, our towels have been getting a lot of publicity. Top Outdoor Gear Reviewer SNEWs gave our towels a 5 out of 5 for functional perfection! One independent review comes from About.com. Mat Leubbers, one of the foremost authorities on swimming, said "this is five-star swim gear..."
The lightweight moisture-management fabric pulls the water from your skin. When the moisture reaches the outside of the fabric, it spreads out to many times its original surface area, enabling it to evaporate very quickly. For competitive athletes, it's a must! Being in and out of the water, you need something that will dry you off, and then dry out very quickly. Whether its for swimming, or a shower after other sports, the Ultra Fast-Dry Towel is the perfect choice. The towels are highly recommended by Travel Independent, as the best choice for lightweight packing. The fabric is made with a special technology that discourages bacterial growth so your towel won't get that "smell" that cotton towels generate. This anti-microbial technology is virtually permanent, it doesn't wash out! It also boasts SPF sun protection anywhere from 15-40, depending on color (the darker the color, the higher the SPF). This fabric dries 3 times faster than cotton, yet it is so lightweight it looks almost sheer. Very soft against the skin, but it's a hardworking fabric. Why do our towels stay so fresh? The fabric in Discovery Trekking fast-dry towels utilizes Polygiene technology. This is a Silver Salt antimicrobial treatment that is extremely safe and effective. Silver Salt is naturally present in drinking water and soil, and does not have adverse effects on the environment. This process uses recycled silver…the equivalent of 2 silver rings is used to treat over 5000 towels. Polygiene is Bluesign approved, the highest standard of safety recognition. Of course, the towels still need to be washed regularly! Should your towel develop any odors, simply wash in hot water to remove residues from soaps and lotions. This way, the silver will be able to continue killing mold and bacteria and your towel will smell as good as new. For team pricing or volume purchases, call us. A fabric that actually gets COLD???? It’s hard to imagine how many possible uses there are for such a great product. Naturally, it’s a must for athletes that run or workout in hot environments. Many women experiencing hot flashes will enjoy the instant relief. They can be worn as a neck or head wrap, and are helpful when "cooling" an injured muscle. Anyone who has difficulty regulating their body temperature will benefit from these wonderful cooling towels.